Have you ever peed in your pants? Why do people pee in their pants when frightened? Our urine is stored in the bladder. 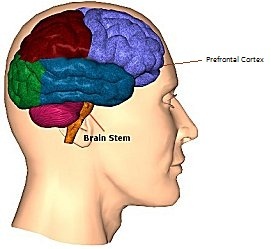 The bladder maintains a constant contact with a part of our brain known as the pontine micturition centre (I spent 20 seconds typing that), which is a collection of cell bodies located in the brainstem. It detects the rise and fall of pressure in our bladder, and it tells us to pee. So this is the area which sends out impulses urging us to urinate whenever our bladders reach the limit. However, the signal can be overridden by the prefrontal cortex, the region of our brain that plans complex cognitive behavior, which sends a restraining signal to the brainstem, otherwise a major part of human civilization would have been dedicated to inventing hand-carry toilets. When we are under stress, the inhibitory signals from the prefrontal cortex which keep us dry most of the time, can themselves be overridden by the signals from our brainstem. So it's all about the battle of the two impulses. 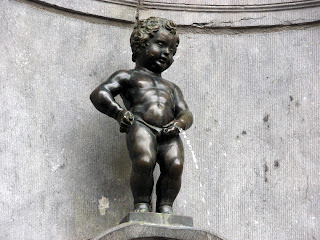 Under stressful conditions, signals from the brainstem become so intense that the it has trouble following the frontal lobe’s commands, which explains why some people urinate more frequently before an important event. In life-threatening situations, the orders become so urgent that you won’t even have time make it to the lavatory. The explanation, however, doesn't answer the larger evolutionary question: why evolution permits peeing in the face of danger? A fleeing wolf has got no time to pick a spot, assume its posture and pee at leisure. But it's clear that urinating in the face of danger pervades the animal kingdom. Perhaps peeing could help turn off the predator's appetite? Where Does Your E-Waste Go? Why Do We Cry When We Cut Onions?